It doesn’t surprise us much that The Promise is getting a great reception. When Avatar: The Legend of Korra was announced, the second most common reaction we saw, after excitement for a lady Avatar and any continuation of the series at all, was disappointment that the story wouldn’t be picking up with the same characters it left off on. What is surprising, as The Beat points out, is that The Promise is excelling in a place comics don’t usually: Bookscan, which tracks sales only in bookstores and other not-a-comic-shop locations, and lesson about cross-media tie ins that comic companies should take to heart. It seems that a return to the adventures of Aang, et. al., has paid off for Dark Horse and Nickelodeon. It’s also paid off for the fandom, and for writer/artist Gene Luen Yang, which is a bit redundant to say. Yang, after all, is a notable member of the Avatar fandom. 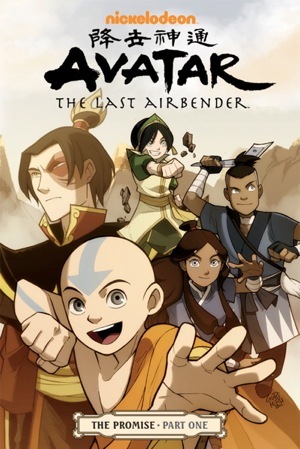 He was brought to the attention of the creators of the series during his campaign against the whitewashed cast of M. Night Shyamalan’s The Last Airbender, and when they approached him to pen an entire comic about the post-war struggles of Avatar Aang and Firelord Zukko in healing the divide between nations (not to mention dealing with a lot of Fire Nation colonists who’d been living in the Earth Kingdom for a couple generations already and didn’t really feel like giving their homes back), he accepted gladly. I’d encourage any fan of the series to pick it up, if you can find a copy! My local comic store was having trouble keeping it in stock. It might lack the movement of the cartoon show, but the characters voices played every line of dialogue perfectly in my head. It’s only the first part of the story, but I’m already hoping it’ll pick up on some of the few loose ends left by the series, especially the fate of Zukko’s mother.